Based on product type, the global cell based assays market has been segmented into instruments, reagents and consumables, assay kits, services, and software. Among these, reagents and consumables constituted 32.1% of the overall demand for cell based assays in 2017, which was worth US$4,356.6 mn. Increasing adoption of cell-based consumables by prominent biopharmaceutical companies and growing number of contact research organizations are some of the factors reflecting positively on this segment. By the end of the forecast period, 2022, the reagents and consumables segment is expected to lose a little bit of ground, although it will remain the most profitable product-type, promising a demand worth of US$6,260.2 mn by 2022. This segment alone is projected for a CAGR of 7.5% during the said forecast period. On the basis of end-user, the global cell based assays market has been bifurcated into pharmaceutical and biotechnology companies, academic institutions, contract research organizations, and other end-users such as clinical laboratories, hospitals, and environmental monitoring labs. Currently, pharmaceutical and biotechnology companies serve the maximum demand, which is a reflection of growing adoption of cell-based assays for drug discovery by the end users, especially in the developed countries within North America and Europe. Application-wise, the global cell based assays market has been categorized into drug discovery, predictive toxicology, basic research, and other applications. Geographically, this report gauges the potential of cell based assays market in the regions of Europe, North America, Asia Pacific except Japan (APEJ), Latin America, and the Middle East and Africa (MEA), as well as in the country of Japan. In 2017, North America emerged as the most lucrative region for the vendors operating in this market, representing a demand worth of US$5,164.0 mn. 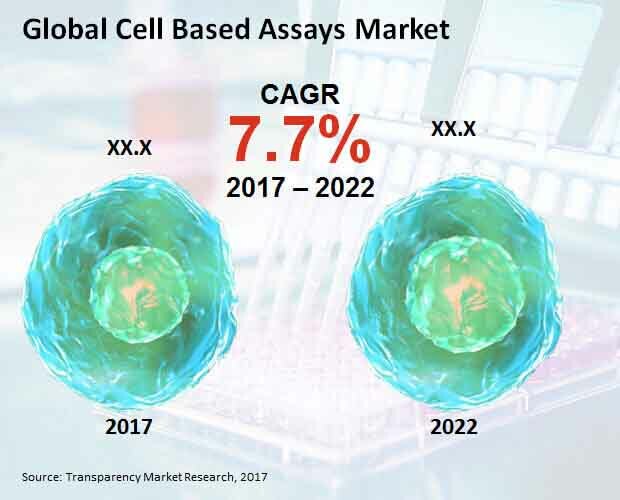 The North America cell based assays market has been expected to experience incrementing demand at an above-average CAGR of 8.2% to reach a valuation of US$7,672.5 mn by 2022. The dominance of this region can be attributed to growing availability of funds for research and resilient drug discovery activities in the country of the U.S. While Europe is currently the second most profitable region, promising a demand for cell based assays that would be worth US$4,864.3 mn by 2022, its CAGR for the said forecast period is 6.9%, substantially lower than the same for APEJ, which is projected to increment the demand at 8.1%. China and India are identified as most profitable countries in the region of Asia Pacific except Japan, driven by the availability of low cost labor, which has attracted a number of companies to invest. Some of the key companies currently operating in the global cell based assays market are: Becton, Dickinson and Company, GE Healthcare, Cell Signaling Technology, Life Technologies Corporation, Danahar Corporation, Cisbio Bioassays, Merck KGaA, Discoverx Corporation, Thermo Fisher Scientific Inc., Perkinelmer Inc., Promega Corporation, Proqinase GmbH, Enzo Life Sciences, Inc., Charles River Laboratories International, Inc., Biospherix, Ltd., Essen Bioscience, Marine Biological Laboratory, Miltenyi Biotec, Bioagilytix Labs., Lonza, Aurelia Bioscience Ltd., Selexis SA, Cell Biolabs, Inc., Biotek Instruments, Inc., Qgel SA. The global cell based assays market report comprises an elaborate executive summary, which includes a market snapshot that provides information about various segments of the market. It also provides information and data analysis of the global market with respect to the segments based on product type, end users, application, and geography. A detailed qualitative analysis of drivers and restraints of the market and opportunities has been provided in the market overview section. In addition, the section comprises dynamics of the market, supply chain, cost structure, pricing analysis, raw material sourcing strategy and analysis, and supplier list. This section of the report also provides market attractiveness analysis, by geography and market share analysis by key players, thus presenting a thorough analysis of the overall competitive scenario in the global cell based assays market. To compute the market size, in-depth secondary research is done. Data points such as regional splits and market split by product type, application, and end use type have been assimilated to arrive at the market estimates. TMR triangulates the data via different analysis based on supply side, demand side, as well as dynamics of cell based assays market. TMR not only conducts forecasts in terms of value, but also evaluates the market on the basis of essential parameters, such as Year-on-Year (Y-o-Y) growth. This helps providers to recognize the future opportunities as well predictability of the market. Vital feature of this report is the analysis of the global cell based assays market by product type, end use type, application, and region; and the corresponding revenue forecast in terms of absolute dollar opportunity. This is traditionally overlooked while forecasting the market. However, absolute dollar opportunity is critical in assessing the level of opportunity that a provider can look to achieve as well as to provide potential resources from sales perspective of the cell based assays market. On the basis of product type, the global cell based assays market has been segmented into instruments, assay kits, reagents and consumables, software, and services. On the basis of end-user, the global cell based assays market has been bifurcated into pharmaceutical and biotechnology companies, academic institutions, contract research organizations, and other end-users such as clinical laboratories, hospitals, and environmental monitoring labs. Application-wise, the global cell based assays market has been categorized into drug discovery, predictive toxicology, basic research, and other applications. Some of the key companies currently holding position of strength in the global cell based assays market are GE Healthcare, Becton, Dickinson and Company, Danahar Corporation, Cisbio Bioassays, Cell Signaling Technology, Life Technologies Corporation, Merck KGaA, Essen Bioscience, Discoverx Corporation, Thermo Fisher Scientific Inc., Perkinelmer Inc., Promega Corporation, Proqinase GmbH, Enzo Life Sciences, Inc., Charles River Laboratories International, Inc., Biospherix, Ltd., Selexis SA, Marine Biological Laboratory, Biotek Instruments, Inc., Miltenyi Biotec, Bioagilytix Labs., Lonza, Aurelia Bioscience Ltd., Cell Biolabs, Inc., and Qgel SA. For each of these companies, the report provides business overview, number of employees, brand overview, key competitors, business overview, business strategies, recent/key developments, acquisitions, and financial overview (wherever applicable).